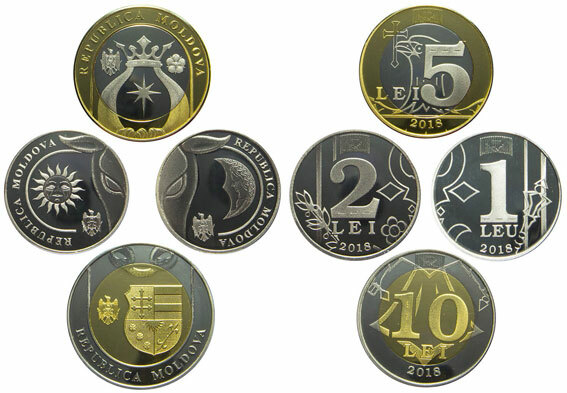 The National Bank of Moldova has issued new coins of 1, 2, 5 and 10-lei that will circulate alongside existing banknotes of the same value, shifting the country’s coin-note boundary. The National Bank of Moldova (NBM) performed a broad economic study on cash use within the country, conducting public consultations with independent experts, local and central authorities, representatives of the business and banking environment. The NBM found that the low value banknotes used in the country – the 1, 5 and 10 lei denominations – entered what it calls the “monetization zone” due to their frequent use for daily purchases. As such, these banknotes deteriorate quickly resulting in a short lifecycle. Image courtesy of the National Bank of Moldova. To counteract this effect, and make significant savings in production costs, the NMB have issued coins of the same value as well as introducing a new 2-lei coin. The NMB says this will optimise cash in Moldova according to international best practices due to coins having a lifecycle ten times longer compared with low value banknotes. The silver coloured 1 and 2-lei coins are produced using nickel plated steel. The 5 and 10-lei are made using steel coated with nickel and copper, having a bi-metallic appearance – the 5-lei coin has a silver centre with a golden coloured ring and vice versa for the 10-lei coin. The design of the coin includes a monogram of capital letters “R” and “M” to represent the Republic of Moldova, which become visible when the coin is rotated left to right. Each coin has a reeded-edge pattern, differing slightly with each coin to assist those with visual impairments to identify the coins’ denomination. The obverse of each of the four coins have been designed in a way that, when putting them together, reveals the Moldavian Principality coat of arms.